A couple of nights ago, Baby Boy decided not to go straight back to sleep after his 2 a.m. feed. Apparently it was play time! Long story short, by the time he fell asleep again at 3.30 I was wiiiiiide awake. So what else could I do but get out of bed and get a bit of sewing in?! 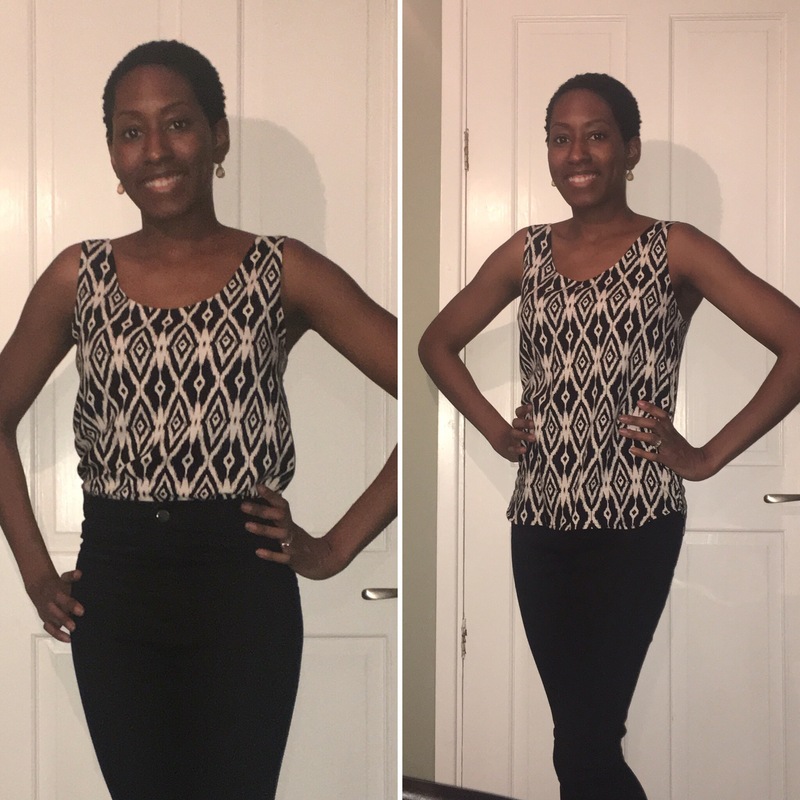 I decided to blitz through making a simple top for layering under jackets/cardigans for work and since I’d already purchased the Silk Cami pattern by Sew Over It for exactly this purpose, it was a no-brainer. I deliberated over whether to use this fabric or a plain ivory crepe fabric from my stash, but I figured a busy pattern would help disguise any mistakes on my first attempt at this pattern and so I cut out the Ikat viscose you see before you. The pattern was nice and straightforward, two main bodice pieces and two facings. It was my first time sewing facings and I love the finish. Speaking of finishes, the pattern is French seamed so just as pretty on the inside as outside. Even the method of attaching the shoulder straps made for a lovely neat finish! The one thing I struggled with was sewing the slippery material. Cutting was fine, with my rotary cutter and mat, but when I went to stay stitch the pattern pieces I realised what all the fuss was about regarding sewing slippery fabrics – eek! I had purchased a walking foot because I knew at some point on my sewing journey I want to work with silks as well as leathers, so I dug it out and spent a bit of time figuring out how to attach it etc. I was underwhelmed with the result, the fabric still had a mind of its own and was all over the place as I attempted to stitch it. Since it was worse than with the standard foot, I changed them back and tried a tip from Tilly of Tilly and the Buttons and put some Scotch magic tape under my presser foot. Much better! I still had to do much more “guiding” of the fabric than I usually do (“Usually”! Pah! This is only about the third garment I’ve made!) but I got there in the end. I *think* I should be able to graduate to a silk version soon. But only once I’ve used enough of my stash to be allowed to go fabric shopping again. Anyway, back to the pattern – I love it. I did a tiny alteration on the shoulder seams to account for my sloping shoulders/round back situation, but from there down the pattern is unaltered. I love the silhouette both loose and tucked in. It also has a lovely curved hem in the front and back (deeper/lower curve in the back) that my hemming skills just didn’t do justice to, but I hope I’ll do better on the next ones as I get more practice. 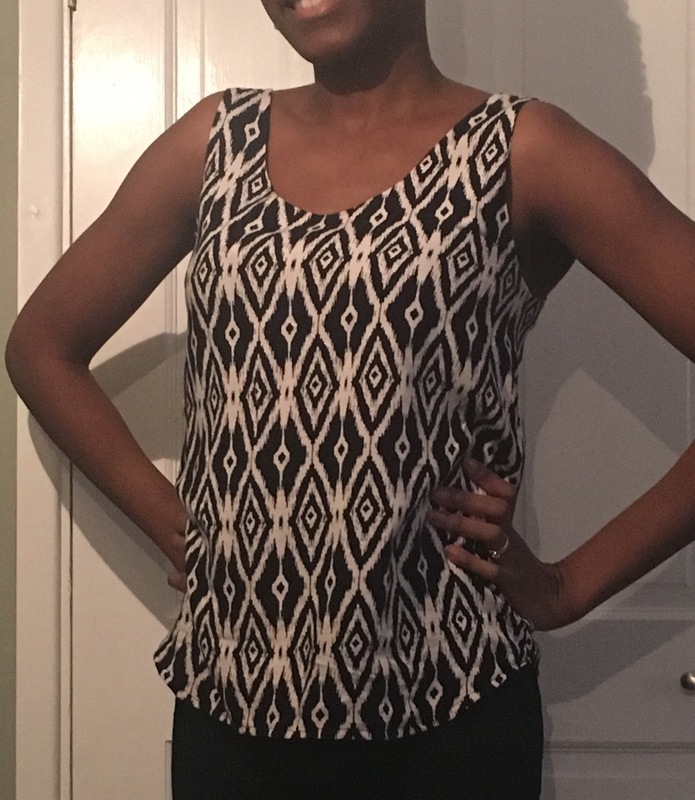 All in all, this is a quick, easy, classic top to make that I know will look great under a suit jacket or a simple cardi, or on its own in warmer weather. I’m already planning a few more! Nice job ! I love the print . I haven’t worked with silk yet, after years of sewing. You’re very brave to try it so soon. Hey I love this top! Incidentally I have just over a metre of this Ikat Viscose in my stash and I’ve just got it out and cut a Merchant and Mills Camber top out of it. I will use your tips for sewing with it and hope for the best.